For those who lived through 1933, it is unlikely a year they remember with much fondness. The news was nearly all bad. It was the height of the Depression, Hitler was appointed by Hindenburg to be Chancellor of Germany and a monster was sighted in a tranquil, beautiful lake in Scotland called Loch Ness. It’s likely “Nessie” got almost as much press in 1933 as the Depression. Certainly she got as much as Hitler who few took seriously at the time. In 1933 a new road was constructed around the Loch giving motorists a clear view of the water. Soon reports of Nessie sightings began to reach the local paper which published an article and the story was soon taken up by the national and then international press. According to Wikipedia ” The word “monster” was reportedly applied for the first time to the creature on 2 May 1933 by Alex Campbell, water bailiff for Loch Ness and a part-time journalist, in an Inverness Courier report. On 4 August 1933 the Courier published a report by Londoner George Spicer that several weeks earlier, while they were driving around the loch, he and his wife saw “the nearest approach to a dragon or pre-historic animal that I have ever seen in my life” trundling across the road toward the loch with “an animal” in its mouth. Letters began appearing in the Courier, often anonymously, claiming land or water sightings by the writer, their family or acquaintances or remembered stories. The accounts reached the media, which described a “monster fish”, “sea serpent”, or “dragon” and eventually settled on “Loch Ness monster”. Of course the press wanted a photo of Nessie. 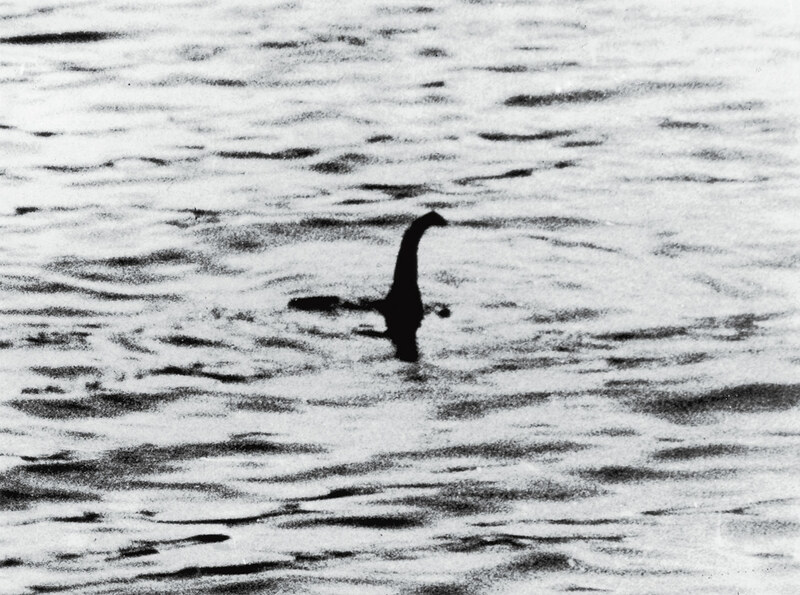 According to a website on Nessie “the above photo was said to be taken by British doctor Robert Wilson. Wilson, however, had simply been enlisted to cover up an earlier fraud by wild-game hunter Marmaduke Wetherell, who had been sent to Scotland by London’s Daily Mail to bag the monster. There being no monster to bag, Wetherell brought home photos of hippo prints that he said belonged to Nessie. The Mail caught wise and discredited Wetherell, who then returned to the loch with a monster made out of a toy submarine. He and his son used Wilson, a respected physician, to lend the hoax credibility.” This photo, although a fraud, is considered one of the 100 most influential photos of all times. If you have any doubts about Nessie you can visit Loch Ness which has now made the monster a theme for tourism. It is claimed Nessie first appeared in 568 AD when it ate a child so it might be advisable, depending on how the little darlings are behaving on the trip, to leave the kids at the motel. In the United States Franklin Roosevelt, having been elected in November of 1932, was waiting not too patiently to take the oath of office as President. It nearly didn’t happen. 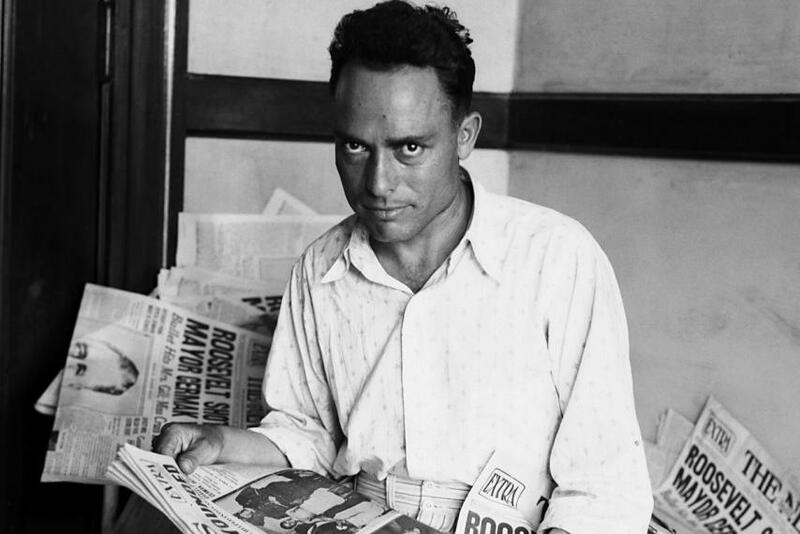 On February 15, 1933 Giuseppe “Joe” Zangara an Italian anarchist fired 5 shots at the President elect during a speech in Miami. He failed hit his intended target, FDR but did fatally wound the Mayor of Miami and injure 3 others. Ironically it was the rich capitalists who came to hate FDR as a “class traitor” when his government programs such as the New Deal and Social Security threatened their grip on the economic levers of power. In other US news work began on the Golden Gate Bridge, Clyde Barrow of Bonnie and Clyde fame killed a deputy following a bank robbery and John Dillinger robbed his first bank and was imprisoned but escaped and went on crime spree. The government did have one success, Machine Gun Kelly was given a life sentence and died in Alcatraz 21 years later. In prison he was given the nickname “Pop Gun Kelly” because he was such a mild mannered model prisoner. 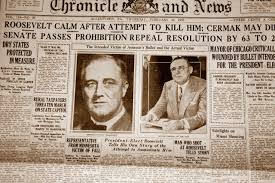 Prohibition was repealed and “National Beer Day” proclaimed and FDR set the first minimum wage of 33 cents per hour, further angering the moneyed class. Albert Einstein was granted refugee status in 1933. Newsweek and Esquire debuted, Wiley Post, an American aviator, completed the first solo flight around the world in just over 7 days and the first drive-in opened in Camden New Jersey. In baseball the Yankees were shut out on August 3, 1933, the first time they had been shut out since August 2, 1931- 308 games, an absolutely amazing feat. 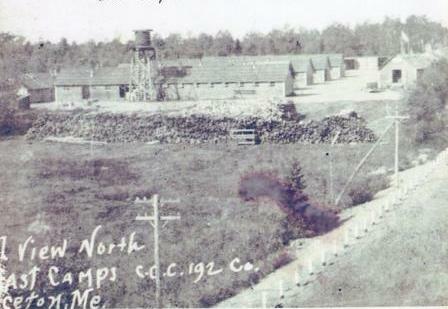 Locally the Civil Conservation Corp. “CCC” 192nd co. camp near Princeton, was built in 1933. The Civil Conservation Corp was established in 1933 by the recommendation of President Franklin B. Roosevelt. This CCC Camp in Indian Township was called the “Far East” 192nd co. camp, and was under the immediate supervision of the Maine Forest Service from June 1933 to June 1941. The Far East Camp focused on forest culture, road construction and maintenance, and extended West Street on what is presently called the Stud Mill Road.During WWII the camp was modified, in part, by the addition of a barbed wire fence, additional fences, and four guard towers. After approval from the U.S. Truman Committee this camp then became a Prisoner of War camp in 1944 and housed from 250-500 German prisoners. The prisoners worked in the woods primarily cutting pulpwood for the local paper mill. Picture taking was not allowed within the POW camp. The news in Princeton in 1933 was not, on the whole, very positive. The loss of train service was a serious matter to small towns as the roads were still mostly unpaved and virtually impassable at many times of the year. 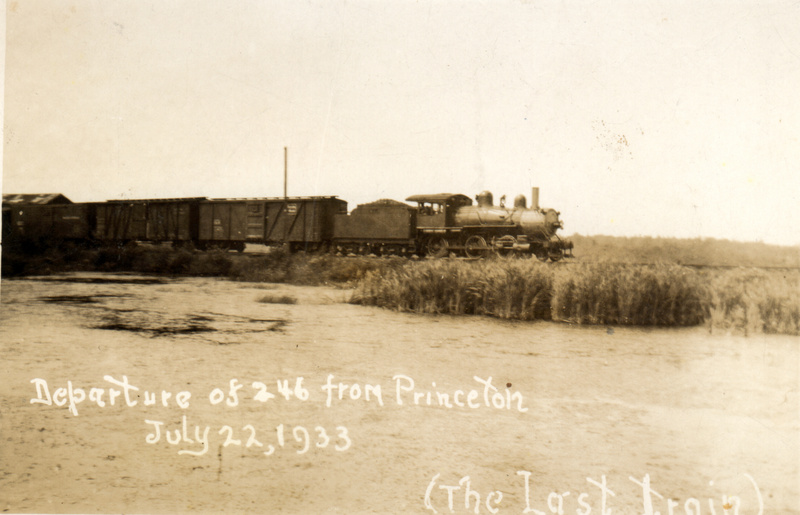 The economy suffered when the trains stopped running and Princeton was no exception. In 1933 the Depression in the St Croix Valley deepened. The year saw the closing of the Calais National Bank, The International Bank in Woodland and the bankruptcy of numerous businesses.Unemployment soared to levels unimagined in the roaring 20’s. Sports remained a primary diversion of an uneasy and worried populace. 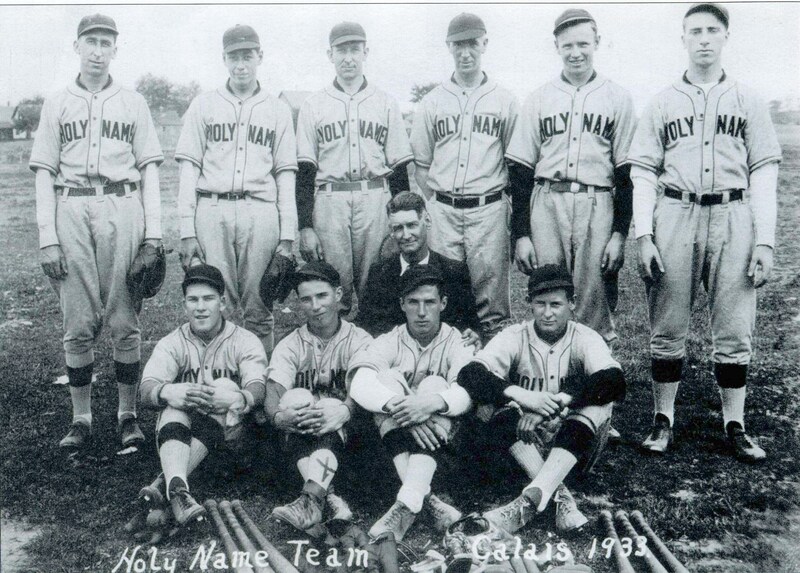 Baseball was the most popular sport and the Catholic Holy Name team was one of the best.They are- Front from left: Dana Miles, Mike Casey, “Shim ” Curran and Paul Donovan. Middle manager Paul Donovan. Rear Ted McLain, Phil Trainor, Theo McLain, “Peach Driscoll. Leonard Sabattus and Jack Casey. 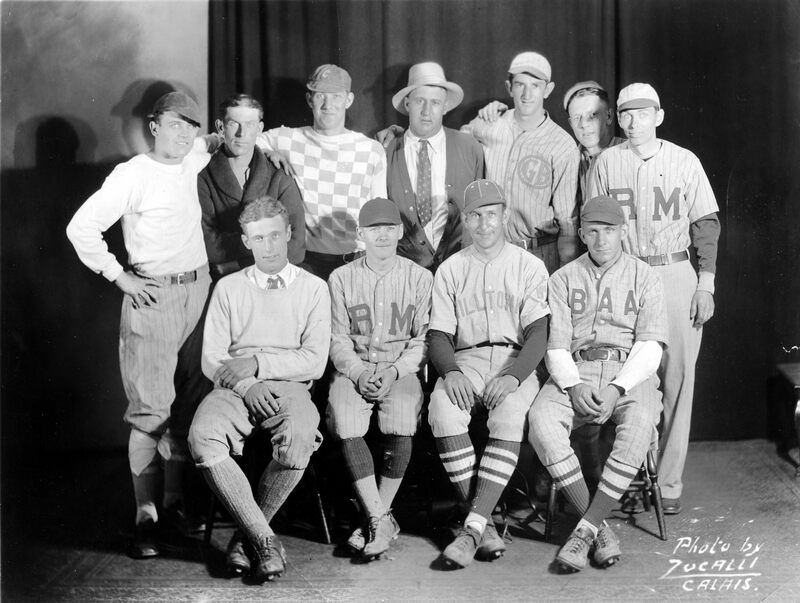 There were several other baseball teams in the St Croix Valley in 1933. Each town had a team including both Milltowns. This group may be an all star team. From Left: back John McPhee, Frank Fenderson,Jim McClure, Charlie Noble, William Tracy, Earl Skids, John Trainor, Front “Pollock” Noble,Horace Russell, Theo McLain, Ray Moffitt (perhaps). Some of these fellows are from Milltown, Frank Fenderson is not the Frank Fenderson who sold insurance but the Milltown Frank Fenderson. Theo McLain however lived on Calais Avenue and was one of the best baseball the area ever produced. He also played for the Holy Name team above and was recruited by teams in St Stephens. His daughter Polly still lives in the family home. Many may also remember Bill Tracy. These 1933 photos show the approach to the Ferry Point Bridge before the new customs house was built in 1935. For prospective the partly visible building at the far left of the top photo is Andrews Tobacco Store. St Stephen can be seen across the river in the center of the bottom photo. Grant Anderson and Olympia were torn down in 1935 to build customs. In 1933 customs was on the right just before the bridge in a small, one story building. The bus stopped in the center of the bottom photo is being inspected by customs officers. Olympia sold Moxie, ice cream, tobacco and candy. 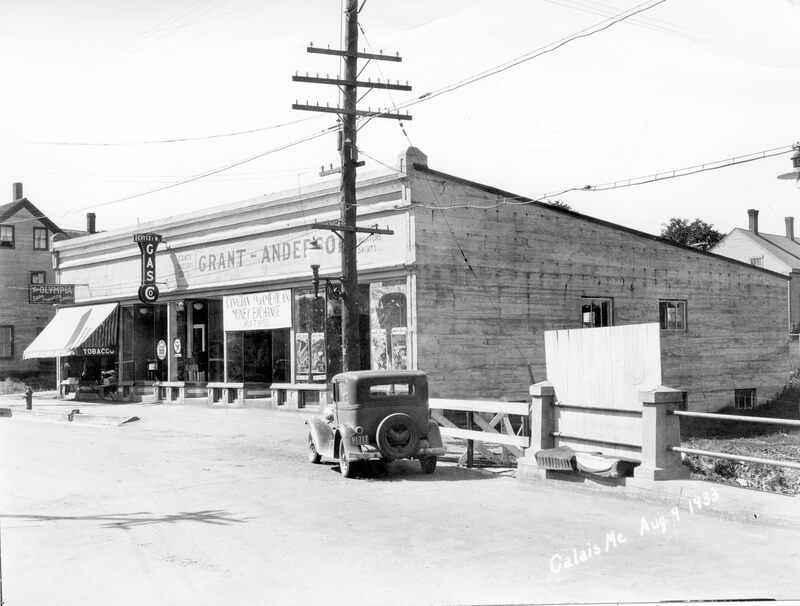 Grant Anderson was a clothing store and, in this photo, also a money exchange operated by Arlo Bates. 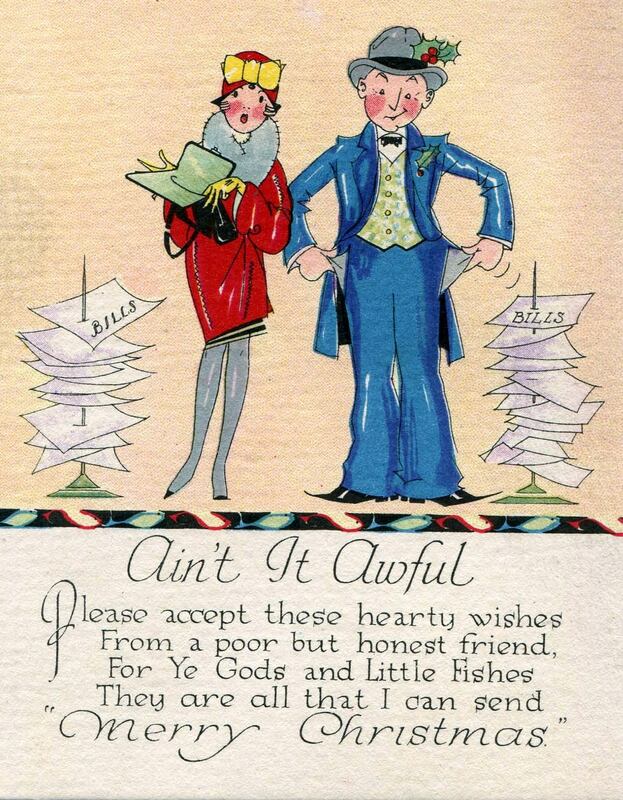 As tough as times were in 1933 people still sent Christmas cards and managed to retained their sense of humor.